Autumn is in full swing, and so is the fall foliage! Head out to one of Tokyo’s many temples and shrines to enjoy the changing colors, but don’t forget to check out all the fabulous markets and exhibitions happening all month. Besides the specific fall foliage events listed below (Rikugien Autumn Leaves Light-up and the Ginko Festival), there are numerous other places to view Tokyo's autumn colors. See our Two-Day Tokyo Fall Foliage Itinerary for our pick of the best spots, planned out to help you maximise your time. This exhibition at the Suntory Museum of Art that's themed entirely around Shingon Esoteric Buddhism in Kyoto's Daigoji Temple is, fittingly, quite esoteric. Focusing on Daigoji Temple’s transformation throughout the last millennium from the Heian period to the present day, you’ll see some extraordinary works of art ranging from Buddhist statues to fusuma (screen) paintings. Do you love Japanese art? Do you also consider The Urinal to be a seminally groundbreaking work of art (even if Duchamp did purportedly steal the idea?) If so, you’ll love this exhibition, which traces the creative activities of Marcel Duchamp (1887 - 1968) through works borrowed from the Philadelphia Museum of Art. Juxtaposed against his pieces are Japanese works of art created in different social environments, creating fresh connections and contrasts between the two worlds that the artworks embody. Closed: Second and fourth Wednesdays; 28 December 2018 - 4 January 2019. Inspiration for creating works of art knows no bounds. This exhibition showcases a variety of works across all kinds of media - paintings, sculptures, and fashion - to show just how non-European cultures and arts impacted and influenced the Art Deco movement of inter-war France. We suppose it’s kind of a way of giving credit where it’s due. Viewing art at the Mori Art Museum. © Viewing art at the Mori Art Museum. 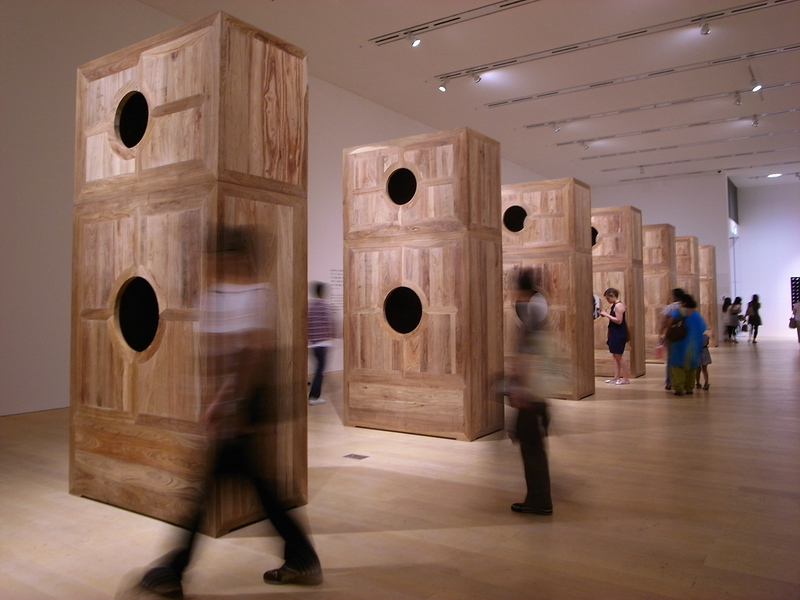 Coming hot on the heels of what’s been a rather catastrophic summer for many areas in Japan, this timely exhibition at the Mori Art Museum explores what art can do for us in times of chaos and grief. Media coverage and disaster relief works aside, the exhibition collects and considers the role that artists and their art play in responding to disasters. Can art offer new visions, hopes for a better future, make sense of grief and destruction, or simply allow us to understand ourselves in the wake of catastrophe? If you’ve been pondering these questions recently, this is the exhibition to go to. Tokyo's most prestigious film festival is back! The 31st edition will see another fabulous lineup of special events and screenings. Watch sports films and documentaries at an outdoor screening at the foot of Tokyo Tower; or veg out at the outdoor theatre at Tokyo Midtown Hibiya. Of course, the first day will see celebrities and filmmakers from all over the world walking the red carpet in Roppongi. Check the website for full details on the festivities. Sure, you can eat ramen any time you want - but at the annual Tokyo Ramen Show, you can slurp up the best of the best in Japan. The nation’s finest ramen makers gather in Komazawa Olympic Park to show off their noodly goods. Every conceivable style you can think of is represented, along with limited edition event-only specials you won’t find at their shops. 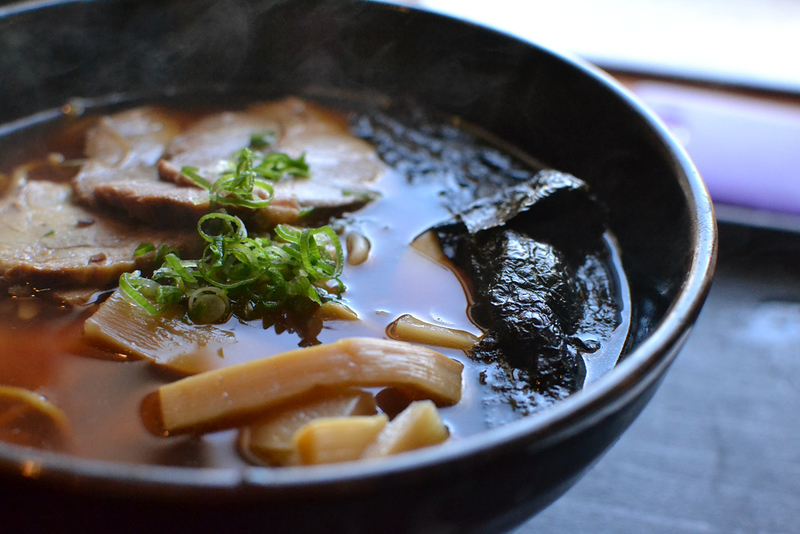 Ramen aficionados are serious about their bowls, so be prepared for crowds. Stemming from a tradition dating back to the Edo period, this is a famous triple-whammy festival at Hanazono-jinja Shrine in Shinjuku, with 3 markets and festivals over three sets of dates. 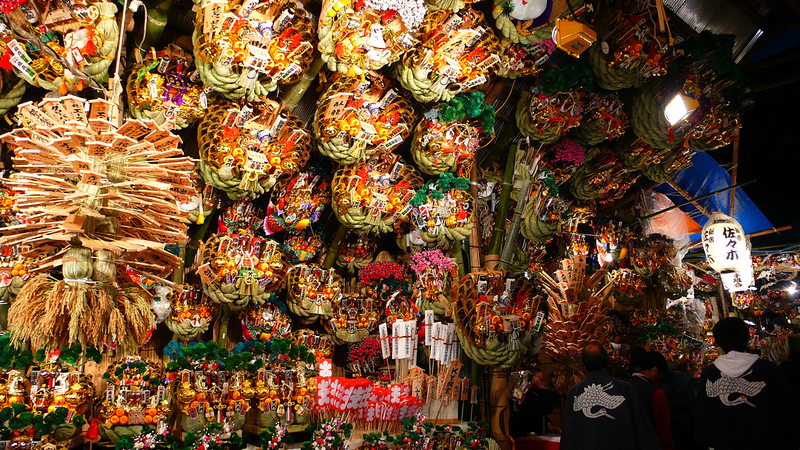 Tori no Ichi, the first, starts with a warm-up festival at night, followed by a full event on the following day. The second and third festivals are on 13 and 25 November respectively. There’ll be stalls selling foods, festival paraphernalia, and kumade rakes that bring good fortune for your businesses. Come hungry and make merry the whole night through. Taking place every autumn since 2011, the Smart Illumination show in Yokohama makes the city’s waterfront areas all shiny and colorful with energy-efficient lighting technology. It’s quite a spectacle and fantastic if you like bright lights - while it bills itself as a combination of art and technology, think of it as a follow-up to the summer fireworks. While the main festival takes place from 31 October to 4 November, you can go any time to see the illuminations until the end of the year. Perfect for romantic strolls. Chrysanthemum lovers, rejoice! Autumn is here and so are your favorite velvet-petalled pom-pom-esque pastel-colored flowers. 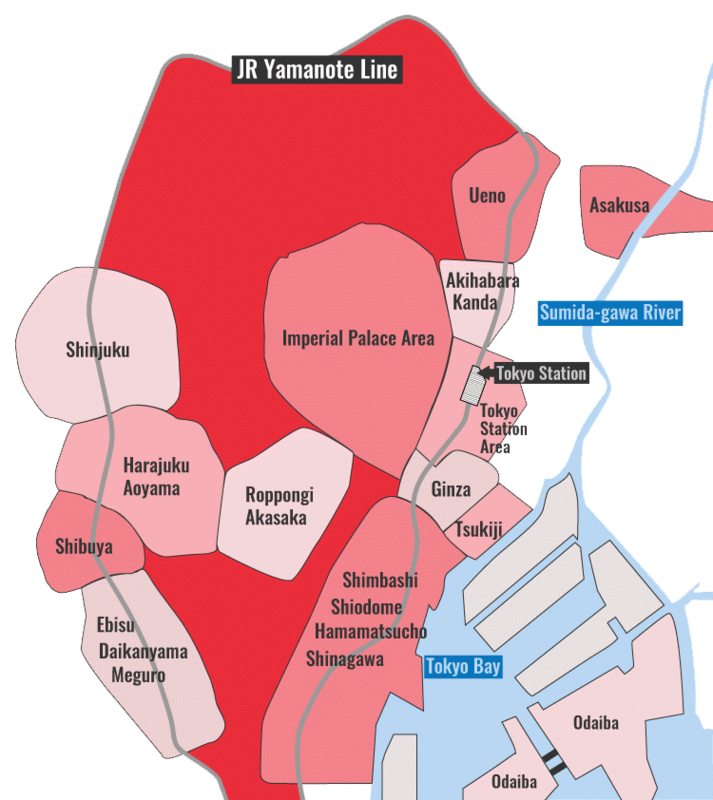 The annual Tokyo Metropolitan Tourism Chrysanthemum Exhibition (a mouthful, we know) has been going strong for over 100 years. Unsurprisingly, it’s the foremost exhibition for these flowers in terms of quality and quantity. You’ll see all varieties and styles of chrysanthemums, from rare ones to edible ones. If you can bring them home, there are even seedlings for you to pick up. Or you could just enjoy the blooms. Who doesn’t love a good bowl of curry? Get thee to Kanda this November for the Kanda Curry Grand Prix, where 20 restaurants compete against each other to earn the honor of best curry in the area. Considering that there are over 400 curry restaurants in Kanda, this is no bite-sized prize - it’s the real deal. But regardless of whoever wins, know that you’ll be getting some seriously tasty gravies around this side of town. The market is closed in case of rain, but this market is held twice a month. So, if that happens, you can try your luck again on 18 November. It’s that time of the year again - your favorite art & design jamboree is back! 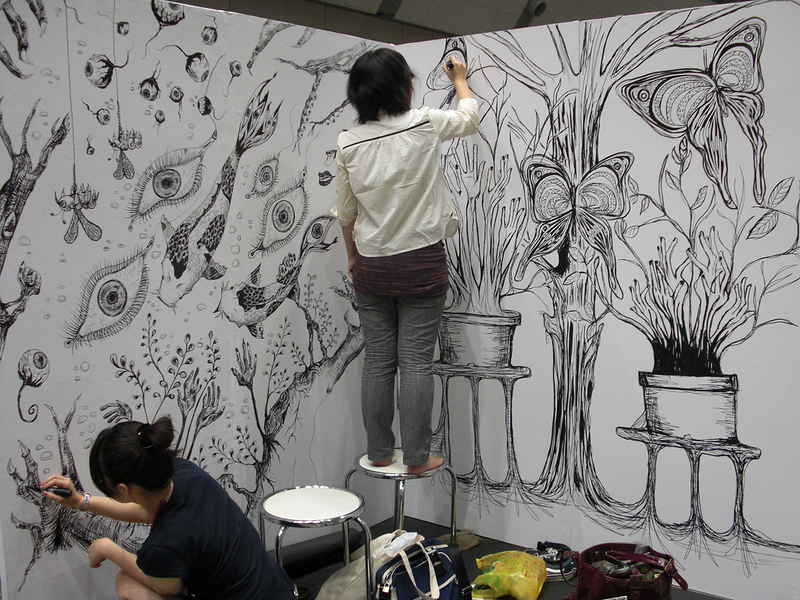 A whopping 15,000 artists from within Japan and without are descending on Tokyo Big Sight to bring you the 48th Design Festa, which has been running biannually in spring and autumn since 1994. You’ll experience the full gamut of artistic expression here across all mediums: crafts, paintings, cuisine, performances, music, dance - if you can imagine it, you’ll find it here. Two day tickets are necessary if you want to be able to see and experience everything here. Have some extra cash handy, too - you’re sure to walk away with unique handmade gifts and souvenirs for loved ones here. If you don’t have time to visit a brewery (they’re usually nearer mountains), this is one of the closest substitutes. Head over to the Aoyama Sake Flea this month to sip sake samples from over 30 breweries nationwide. Pick up a sake cup and tasting tickets at the entrance and spend your afternoon tasting the best brews they have to offer. (Or you can start before noon; we won’t judge.) Make sure you check the Facebook page for any sake-related events: in the past, they’ve had short seminars on sake by sake bartenders and ‘sake-hopping’ tours. Rikugien’s annual light-up returns! This traditional Japanese landscape garden has some gorgeous fall foliage as beautiful in the day as it is at night. In autumn, they extend opening hours to 9pm, with last entry at 8.30pm, to coincide with the evening illuminations. Be aware that you might have to contend with the post-work crowds here. But it is also one of the few places in Tokyo to see the autumn colours at night, so it’s worth a visit. Snuggle up to a special someone at the cozy teahouses in the garden and enjoy the lights. Any ‘festival’ is really just an excuse to eat and drink under some pretty leaves. 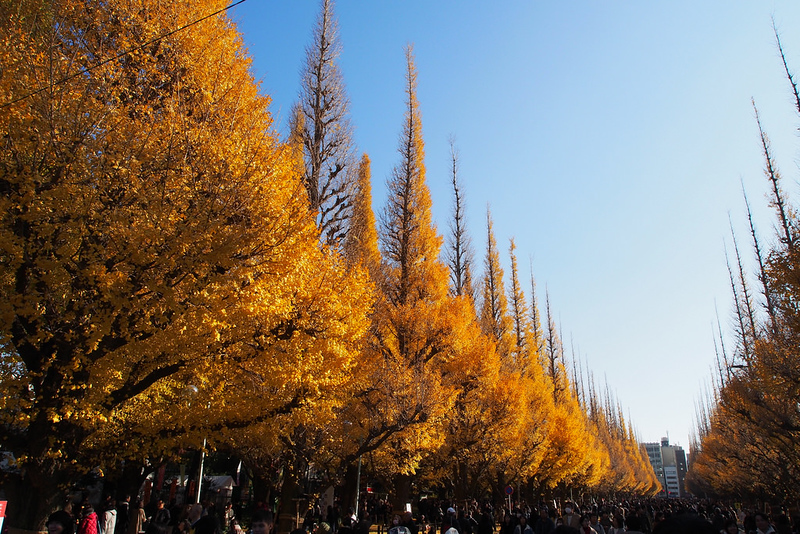 As the tall gingko trees along this avenue turn golden yellow, so too do the 40-odd food and drink stalls begin popping up around the nearby softball stadium. Make sure you check out all the regional food they’re selling, too. Even if you’re not hungry, the view of the trees is a feast for the eyes. This small-scale, local, and charming antique market takes place along the shrine’s main approach every 4th Sunday. Visit to chat and haggle with sellers over items of all kinds: from secondhand clothing to kokeshi dolls to wooden furniture to stamps from several decades ago, you might find anything and everything here. If it rains, though, consider the event cancelled. Comic Con is a big event, and it just gets more and more massive every year. As usual, there are cosplayers, celebrity meet-and-greets (a separate and hefty price tag), a cosplay contest, stage events, exhibits, thousands of booths hawking merchandise of all sorts, and a food court. There’ll also be thousands of event-goers, so steel yourself for the crowds before diving in. On the bright side, children of elementary school age or younger get to attend for free.